We have started Playworks at GETNS! We believe in the power of Play! 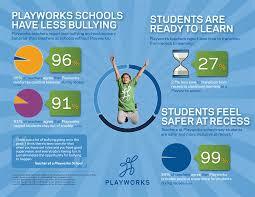 Playworks is a primary school based programme designed to improve break times for children and teachers. Playworks creates inclusive environments for play and physical activity both within and beyond the school day to build empathy, increase learning and improve behaviour, with research showing essential benefits to child development, an improved school climate and more focused students. Break time is designed to become a more active and inclusive experience for all students. 5th class are currently leading 4 games between the junior and senior yard ..
Children can come join in the games during yard at any time. 5th Class are doing a wonderful job encourages players, leading fair play and practicing positivity with lots of high – fives and ro-sham-bo. At the end of yard, the children line up with their classes and part-take in a short cool-down from yard.